On a two-year tour around the globe, an exhibition is currently asking the question: how can designers meet the challenge of a rapidly ageing society? Science is advancing in how it understands the onset of ageing and chronic disease, while technology is stealing the limelight in extending our happy and healthy years for longer. But what does design have to complement these two and what can it offer that our ageing population needs? This new exhibition, New Old: Designing for our future selves, is answering the question of how we can transform the experience of ageing. That answer is seemingly simple – we need to be sensitive – and evidently a touch of sensitivity can go a long way, if we just turn to designers. We are at a time when we know we are going to be living longer. This is having a big impact on society, economically with reductions in tax intakes and more money being needed to be spent on healthcare and pensions, and socially, with a prevalent attitude that our population getting older is some sort of demographic time-bomb. It is this attitude that the New Old exhibition challenges. The New Old exhibition is a re-run from a show in 1986 called New Design for Old, which also examined the theme of design and ageing. Both design and ageing have changed exponentially in the subsequent decades – but, it seems, our attitudes towards ageing haven’t kept pace with those changes. The New Old exhibition expresses how we should see living longer as a “gift” and not a burden and that through good design, innovative products can become far more person-centric and meet the needs, challenges and desires of our ageing population. This reimagining, or redesigning, of older age can change how we perceive ageing to a more sympathetic view that leads us to think more compassionately about how we use the technology and medical knowledge that surrounds us to create better solutions and products for older people. Design-led instead of tech-led products will increasingly allow people to live their longer lives actively, healthily and independently – because people will actually want to use these products, they will like using them. This in turn opens up new markets that allow us to live our new lives aesthetically and conceptually happy. The 1986 exhibition at the Victoria and Albert Museum, London, was when Myerson first recalls being inspired to design for this age group, leading him to become involved in the Royal College of Art’s (RCA) DesignAge research programme. However, when his own parents began to struggle in their late 80s and 90s, his “attention on the ‘design deficit’ in relation to ageing took on an increased focus. For Myerson, however, science and technology have focused too much on deficits and so created more misbeliefs around what it means to be getting older. While society is thinking more sincerely about what it means to be 65+, and while technological innovations are very feasible and viable in terms of affordability, when it comes to new projects for ageing Myesron believes there needs to be balance and these products must be tailored for the person. By creating desire through design he believes this will happen. Of course, AAL has been working in the active and healthy ageing field, producing a number of successful products over the years that address the needs we have in living longer lives, and in recent years the concept of the AAL ecosystem has progressed two-fold, promoting the involvement of the end-user in particular. 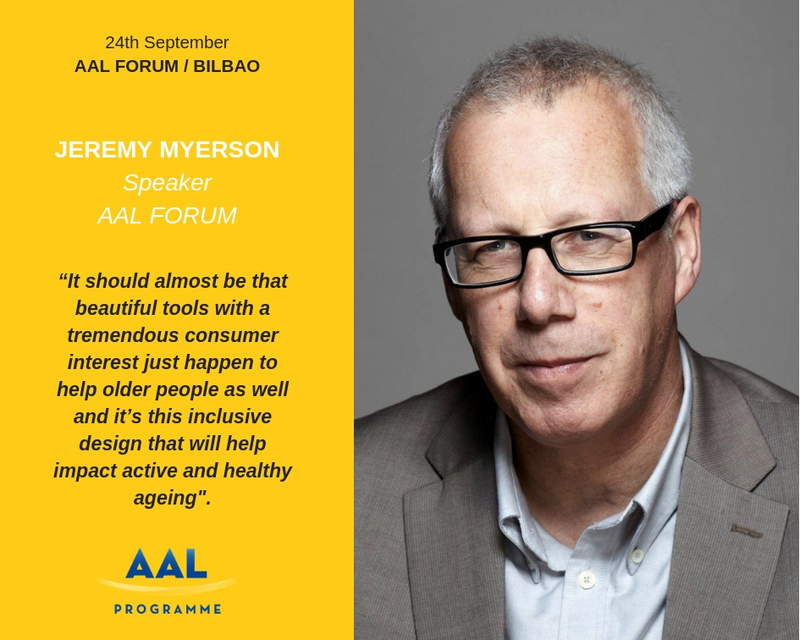 “While Myerson believes innovations need this ecosystem of governmental support, social care and technology, for example, to come together, he also believes that there is still a missing ingredient in how we go about understanding the needs and wishes of older adults, so that the right products can start allowing people to live better, longer, independent lives. “It’s not simply a matter of asking people what they want, that’s a bad idea. People don’t know what they want. We need to encourage end-users to demand things and desire things and invest in things – after all, people will buy things if they see value in them”. “By asking people how they live and about the daily obstacles they face, designers can critique existing products and services, come up with a proposition that addresses this challenge and ask, does it solve the problem, is it helpful and is it attractive? It’s this iterative process of design-engagement with users that is very important. “It should almost be that beautiful tools with a tremendous consumer interest just happen to help older people as well and it’s this inclusive design that will help impact active and healthy ageing”. The 2018 AAL Forum is aligned with the AAL Programme statement, “Ageing well in the digital world”, but it is not focusing on this ambition just within the AAL ecosystem but across Europe and around the world. Technology and its exciting rate of evolution and progression has meant that the opportunities to assist people not only with getting older – keeping fit and active, live independently and be social – but also with being old – falling, cognitive diseases, chronic illnesses and dependency, have increased exponentially. Technology can be seen as a massive driver in creating these new applications that reinvent old age. “Technology can address specific health challenges, it can be quickly adapted or created, and the sooner people start using technology the better it is for living those longer, healthier older years,” says Myerson. “But while the benefits of what technology is doing cannot be by-passed,” he continues, “with a more social and cultural model of ageing, there is a profound implication for designers”. With tech-heavy solutions filling our shelves (figuratively and literally), Myerson sees a space for more design-based solutions. “A design perspective is very people-centric,” he says. “It is a much more positive approach that sees the whole person, something technology developments have often overlooked in the past. “We have many better opportunities to age well due to technology as it is so flexible,” he continues. “But you have to put users first, put yourself in the shoes of the user and that’s what design does and what designers are very good at. They can take technology and put it through a reality check. They give the older person more influence on how things are packaged and presented, on how they will interact with a product and how all this will affect them. “Technologists and designers are already working together and there is understanding that for new innovations to be adopted you need government, local authorities, technology, investment, user input and affordability in place, too.